The New York Dog House is finally open, and offers hot dogs, sausages, fries, cocktails, beer, and wine. I have been curious about New York Dog House since their signage went up a few weeks ago along the well-traveled thoroughfare of 30th Avenue between 37th and 38th Street in Astoria. This week, on their second day of being open, I had the great pleasure of stopping in. The space is well designed and completely welcoming, with wide open front windows (perfect on this oddly warm fall day), a cozy interior, and a nicely sized back garden with ample outdoor seating. I sidled up to the bar, with its eminently cool subway tile wall, and spent some time chatting with their cocktail creator, Adam, a long time Astorian who put together New York Dog House’s excellent cocktail list. The drink menu is divided up between Signature Cocktails named after dog breeds and Classic Cocktails re-named to honor the neighborhood (the “Socrates” is a Negroni for example). I asked Adam his favorite of the Signature Cocktails he created, and he recommended the two spicy drinks: “The Boxer” with bourbon, jalapeño, simple syrup, mint, spiced brown sugar and lime, and “The Chihuahua” with tequila, jalapeño, simple syrup, orange liqueur, lime, and spiced brown sugar. I decided to save the cocktails for a cooler day and opted instead, as I often do, for a draft beer. A friendly bartender, Evan, seconded my instinct to try the Warsteiner Oktoberfest ($5), a light, drinkable take on an autumn beer. La Fin Du Monde ($8), Kelso Nut Brown ($6), and Dog Fish 90min IPA ($8) rounded out the taps. Eight or so additional bottle beers, mostly American craft are also available. Charmed by the service, ambiance, and drinks, I decided to check out the food menu too. Evan let me know the current menu is a launch menu that will soon be expanded, but as it currently stands, there are a lot of great looking options. 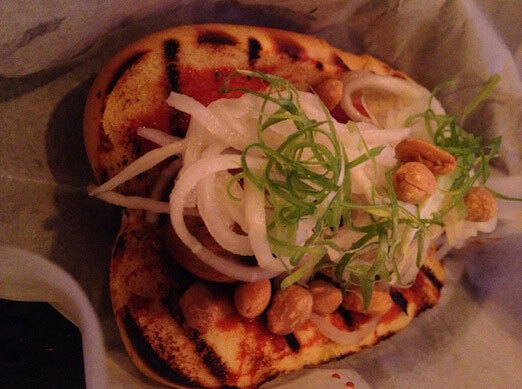 After considering the Relish Dog, house made zucchini relish and pickled red onion piled on bratwurst, I decided instead on the Far East Dog ($8), topped with sesame chili paste, pickled daikon, scallion and peanuts. Generously portioned for the price, it’s definitely a bite I’ll be back for soon. 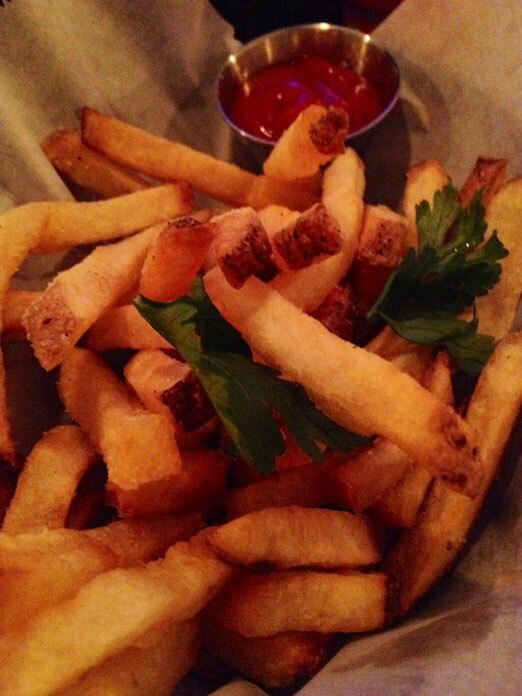 I also tried a side of the hand cut fries ($6) which were quite good. For now, the launch menu includes other intriguing items like Bangers and Mash and a Lamb Burger with cumin mustard that I’ll be back to try. And vegetarians take heart, the expanded menu will include a few meat-free dining options as well. For a place that has been open for two days, I was happy to encounter great food and a warm, friendly staff. I’d encourage folks to check this new place out for themselves, and to stop in and say welcome to the neighborhood! 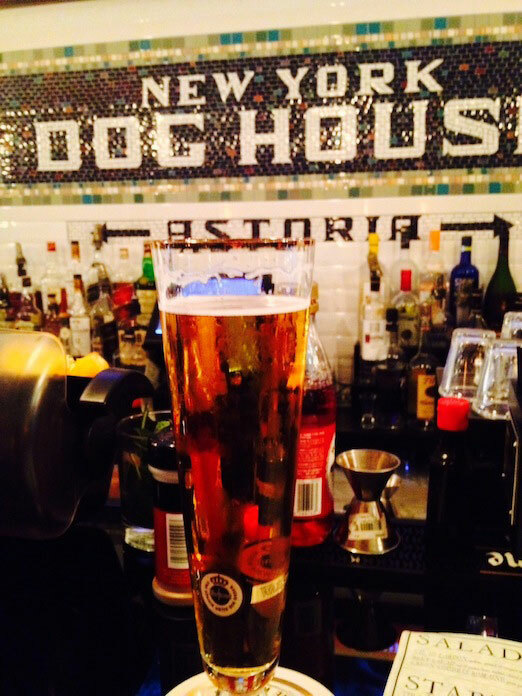 This post was originally published as Welcome to the Neighborhood: New York Dog House on Tastoria Queens.